Memorial has exceeded its trial date of Monday, October 6th 2008. Unfortunately, extended features for this memorial have expired. Sherry Lorraine Johnson was born on Friday, May 11th, 1973 in Owen Sound, Ontario Canada and passed away 11 years and 31 days ago on Monday, March 24th, 2008 in Owen Sound, Ontario Canada. 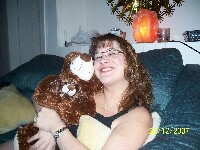 You will be the first to sponsor Sherry's memorial. Sponsorship pledges range anywhere from $5.00 to $100.00. Once the total of all the pledges made reach $100.00, Sherry's memorial will be fully re-actiaved and stay online for an eternity. During Sherry's memorial trial period, she had 62 visitors view her memorial making a total of 6 updates and additions in her memory. The above existing content has not been deleted, and will be restored once Sherry's memorial is fully sponsored. Sponsorship will also reenable contributions, to allow further additions for years to come.